MANILA, Philippines (CNS) — After emerging from a face-to-face meeting with six drug users, Sister Maria Juanita “Nenet” Dano heaved a small sigh of relief that perhaps these men would not meet a bloody end like dozens of others in the San Andres Bukid slum area where she works. The men had come forward to undergo counseling, hoping to change their ways and avoid becoming victims in the government’s ongoing anti-drug war. But their names are on a police list, which makes them targets in massive police operations in force since Philippine President Rodrigo Duterte took office in July 2016. Depending on who is counting, the anti-drug war has claimed from 2,000 to more than 7,000 lives, both in police operations and vigilante-style or extrajudicial killings. Duterte has vowed to end the drug menace and exterminate those involved in it by whatever means necessary. Sister Dano is a licensed social worker who has been doing outreach work since 2011. Half her week is spent in San Andres Bukid, where the religious order maintains an outreach center that serves as an office, meeting place and sleeping quarters for Sister Dano when she is there. Her volunteer partners — local women, from poor families — help the families of drug-war victims arrange funerals. They undergo paralegal training so they can document cases. They spoke about their experiences, but for security purposes asked not to be identified by their real names. Ely said she has had to comfort mothers of those killed and grieves with them. “I am a mother, too,” she said. “Some nights it is hard to sleep when you hear little noises” that might signal a police raid nearby. “When the residents notice unusual police presence, they conclude that there will be killings,” Sister Dano said. The most common prohibited substance used is methamphetamine hydrochloride, known as “poor man’s cocaine” — locally called “shabu” — and marijuana. Shabu is the substance of choice for most drug users and pushers because it is readily available and easy to transport. It is locally produced in hidden laboratories. Chinese nationals with Filipino accomplices who operate the laboratories have been apprehended, charged and imprisoned. Shabu also is sourced from outside the Philippines. It is common knowledge that police also are involved in the drug trade. The oft-repeated police reason for the killings is that the suspects “fought back,” but in most raids, usually at night, the target suspects are unarmed or even asleep. As to unknown assailants in vigilante-style killings, people can only speculate whether the killers are hired by police or drug lords. Sister Dano said she is collating cases of extrajudicial killings for her congregation and others to read. But her focus is to stop those who are addicts from becoming victims in the government’s war on drugs and to live drug-free, meaningful lives. Amina Merced lost her two adult sons and a brother in a police operation in January. A 7-year-old boy told how he found his father lying dead in a pool of blood. With his mother now in jail because of drug-related charges, the boy is being cared for by relatives and neighbors. 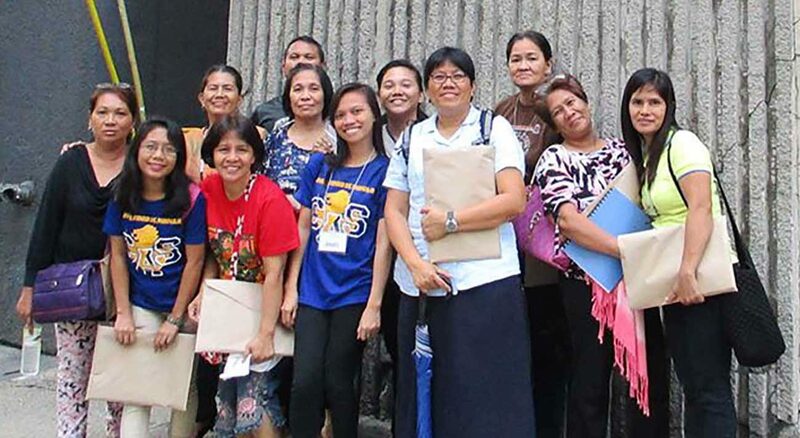 Sister Regina Kuizon, the order’s provincial leader for the Philippines and Japan and co-chair of the Association of Major Religious Superiors in the Philippines, is supportive of Sister Dano’s ministry. Ma. Ceres P. Doyo is a journalist in the Philippines. She writes features, special reports and a regular column, Human Face, for the Philippine Daily Inquirer.